I liked Secret ballot. It's similar to most Iranian films (even though it was written/directed by an Iranian/Canadian from Toronto) as it takes this wildly simplistic idea and then forms a story around it. 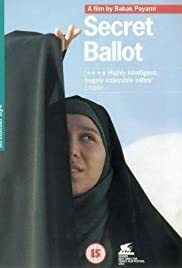 Secret Ballot is about a lot of things: the chaotic election process in Iran, the women/men relationships there, the isolation of rural areas and the role of women in Iranian society. That's four, you could probably find more if you wanted. A woman college age shows up at an outpost remote from cities and people and takes a sloth like soldier along looking for people willing to vote. It's harder to find voters than she thinks it might be as a lot of folks just don't want anything to do w/ the woman or casting a vote for the democracy that she touts ceaselessly. Secret Ballot has a good deal of sly, quiet moments and its this intelligent astuteness that I liked the most about it. I also enjoyed the harsh, remote terrain the film is set. The entire cast is full of non-pros who have never acted before and they do a fine job and are natural throughout. I especially liked the soldier who seems almost catatonic he's so slow talking. This is a very typical Iranian film: simple, slowish, extremely long and drawn out takes and full of non actors and real people. Plus it's a sly satire that has its own charms.